This is the first guest blog from Carrie with the website Cruise Buzz. We're thrilled to have Carrie traveling onboard the Azamara Quest right now. She'll be updating you on her adventures here on the Destination Immersion blog! After traveling almost half-way around the globe, I arrived in Istanbul in time for dinner on Azamara Quest. Upon waking I set out for an entire day of sightseeing in Istanbul. Since I had been to Istanbul before, I opted to go it alone (plus I wanted to sleep in). For those that wanted the organized tour from the ship, there were three to choose from. I would recommend these for anyone who wants to avoid the hassle of getting around on their own and having to deal with obtaining tickets to the sights. Istanbul is full of history and culture galore. 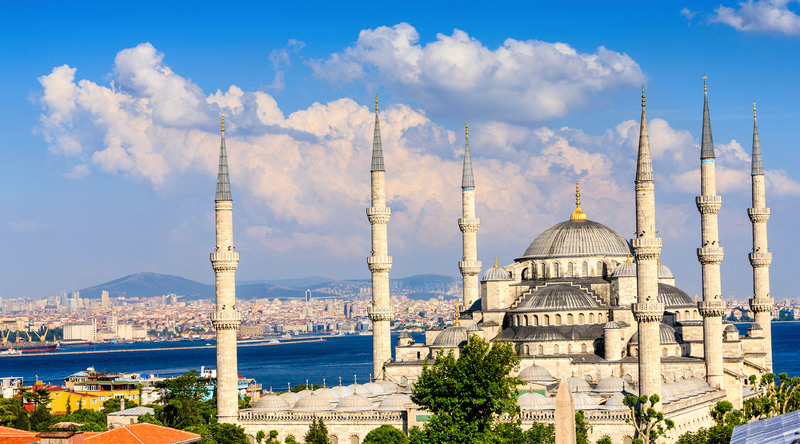 Great mosques, ancient churches, museums, and bazaars. To avoid disappointment, make sure to plan ahead. Those who arrived with enough time to explore the city could do so because Azamara Quest overnighted and stayed in port long enough to accommodate two days of touring. Most of the cultural highlights of Istanbul are concentrated in the old town. The Blue Mosque is renowned for its architecture. There are a total of six minarets (not all of them are in the photo), which makes it unique. I only saw from the outside today because I had already been inside on a previous visit. The architecture and story about this famous mosque is inspiring. Women need to be prepared to wear a shoulder covering if going inside. Within walking distance of the sites in the old town is the Topkapi Palace, a former home to Sultans and state headquarters. This throwback to the Ottoman Empire was the home of the Sultans and their harem. Beginning in the mid-1400s, this summer palace was the house of power for three centuries. Once a church and now a mosque, the Hagia Sophia is a must see for anyone coming to Istanbul. The enormity of the space is impressive as well as the fact that it took 10,000 people to construct the site, which was originally commissioned by Constantine the Great in 326. Istanbul is unique for many reasons. One of the reasons is that it is a city spanning two continents: Asia and Europe. Bridges help connect the two in modern times. About a ten minute walk from the port, you can find a Hop-On Hop-Off boat tour of the Bosphorus. Seeing the sites from the water is a great way to get another perspective of the city. Stops along the way included Beşiktaş (for the Naval Museum, and Yıldız Palace and Park), Emirgan, Küçüksu, and Beylerbeyi.